Magnum French size 7 & 8 stamped from 0.032" marine grade brass, ideal for making those killer musky and pike in-line spinners. 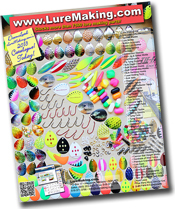 Don't settle for a lesser quality French Blade, get LureMaking.com's Magnum French Blades for all your muskie and pike spinners. Guaranteed big fish catchers! 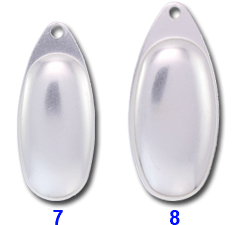 Our Genuine Matte Silver is the whitest, brightest fish catching genuine silver plated blade available ... anywhere! Sizes: 7 & 8 are 0.032" Thick. "... make your own killer musky spinners and save ..."
*Size 7 and size 8 are stamped from 0.032" marine grade brass then matte silver plated and and lacquered.